With 3 great indoor tracks with tunnels and bridges galore, this circuit is a great place to spend karting with offers that allow you to try all 3 tracks in one incredible racing session.With top level facilities to match the tracks, including conference rooms, party rooms and a cafe bar, this is the perfect choice for go karting parties for stags or corporate groups in Northern Ireland. Formula Karting is just of the A2 south of Newry. An adult-only 30-minute open (non-exclusive) practice session on either of tracks 1 OR 2. A junior-only (8y - 16y) 30-minute non-exclusive practice session driving single-engine Karts on either track 1 or track 2. 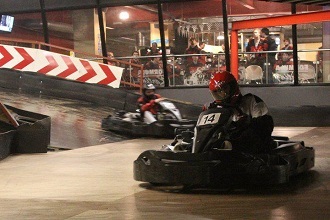 Hen parties and stag night events are commonplace at this excellent venue that can also offer paintballing and greyhound racing as multi activity additions to a go karting event. With excellent facilities including conference rooms and catering facilities, this is the perfect venue to hold a team building day, conference or corporate event.